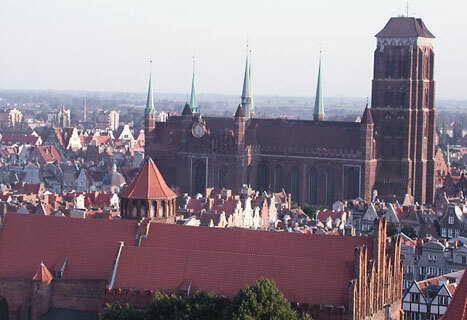 During a casual stroll down many of Gdansk's streets, St. Mary's church can just be seen over the rooftops. Even when you stand directly in front of the tower, it's difficult to understand the scale of this building. But if you can get to a place where you can view the city as a whole, you can truly appreciate the massiveness of this church! It's not just the tower that rises up above the rest of the city, but the entire building dwarfs everything around it! The 'Gothic Church of the Most Holy Virgin Mary,' or St. Mary's for short, was built in several stages between 1343 and 1502. Today, it is the largest brick church in the world, with a length of over 100 meters and a tower reaching 76.6 meters into the sky. With enough capacity for 25,000 people, St. Mary's has a gravity all its own! The darkly coloured bricks and dim nighttime lighting only add to the effect and St. Mary's is definitely worthy of a special evening trip, if you've only seen it during the day. Unfortunately, 'Kosciol Mariacki' was severely damaged during the Second World War during the Soviet liberation of Gdansk. The wooden roof burned, the windows were smashed in, and the heat was so intense that many bricks simply melted away. The floor was also destroyed, as looters ripped up historic tombs, looking for valuables to steal. In anticipation of the worst, many valuable pieces of art were hidden away during the war and survived the chaos, but many have not been returned to their rightful place. However, there are still a great many treasures inside this beautifully reconstructed cathedral. A 46 chord organ built by the master Marcin Friese, enchants all those who hear it lovingly played upon. A late-gothic main alter depicts God the Father, Mary, and Christ sitting together on three incredible thrones. Although there is a slight sense of emptiness, a number of other paintings, sculptures and religious artifacts provide an impressive backdrop for time spent worshipping in this house of God. The church is also home to an incredible timepiece. Built from 1464 to 1470, an astronomical clock stands at a hefty 14 meters! This clock contains 70% of its original elements and tells not only time, but also the day, month, lunar phase, the positions of the sun and moon in relation to the Zodiac, and also tells us that our ancestors were not the backwards people we have a habit of believing them to be! At noon, the clock depicts scenes of the Adoration of the Magi and the Annunciation, while Adam and Eve ring bells from atop this marvel. Even if you don't mean to visit St. Mary's, the aforementioned gravity of the place is sure to draw you closer. There are services every Sunday for visiting Catholics and travelers can check out the interior during daytime hours. Perhaps you'll even be lucky enough to run into Stolem, a friendly giant who visited the church in years past, who used the Church's Basilica as a place to rest and look out upon the rest of lovely Gdansk! Could baptismal records be available from 1894.